Odoo-OpenERP as we know it is one of the fastest growing Open source ERP software in the recent years. The platform continually modifies itself with the updated technologies along with being user-friendly and proffering a quick implementation at a low cost. In addition to this, the solution provides a flexibility where the module can be added according to the growth of the company and extends full integration which basically covers up the complex needs of any company. This customizable platform offers the aforementioned benefits that assist organizations especially SMBs in India to manage their business effectively. However, with this platform being Open Source, it can prove to be tricky if not implemented with the proper assistance and support of an OpenERP Expert/team that possesses the industry-rich knowledge and technical prowess that this platform demands. Choosing the right vendor to work with is imperative but with new vendors mushrooming around and the proliferation of a plethora of solutions, it is proving to be a cumbersome task. 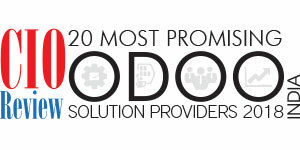 Spearheading this dilemma, CIOReview comes to your aid with an exhaustive list of “20 Most Promising Odoo Solution Providers”. This all-encompassing compilation offers some of the leading Odoo solution providers that display great business acumen, technical expertise and a comprehensive suite of cutting-edge solutions. Their proven track record assures organizations enhanced productivity and business volume with a clear and integrated view of your business. A panel consisting of renowned CEOs, CIOs, industry analysts and CIOReview editorial finalized the list that in our opinion will meet and exceed every customer’s requirements. We present to you CIOReviewindia 20 Most Promising Odoo Solution Providers- 2018. Aspirant Labs India A provider of Odoo Customization and Implementation Services. Its areas of expertise include IT consulting, E-commerce Integration(Presta Shop and Magento) and Data Migration services etc. Biztech IT Consultancy A provider of ERP Development and Customization services that incorporate ERP Development with Odoo, Customization of existing Odoo ERP system and user interface or Odoo app etc. Confianz Global, Inc. A provider of solutions ranging from ERP systems to custom built solutions for web/mobile and from IoT to Big Data Analytics. It focuses on ERP implementation using Open ERP/Odoo. Emipro Technologies A provider of Odoo & eCommerce Application development. It offers a range of Odoo Services including Consultancy, Configuration, Installation, Customization, Support and Training etc. Futurenet Technologies A provider of consulting, implementation and system integration services for IT management. It Offers solutions and services related to Cloud, Operations Analytics, Odoo ERP and ECM etc. Indimedi Solutions A provider of services portfolio associated to Odoo ERP including Implementation, Customization, Odoo Training, Development,Integration, Business Consultation and Migration etc. iSquare Data Systems A provider of end to end Managed IT Services and Consultancy Services. It offers software solutions such as Odoo(OpenERP) Customization as well as Implementation. Itara IT Solutions A provider of Odoo Implementation Services, who has experience in implementing open ERP versions 5.0 to 7.0, Odoo Version 8.0, Odoo9.0incommunityand enterprises. S&V A provider of IT Consulting, Open ERP customization and Installation,and Data Migration services. Its Odoo Open ERP Services include Consulting, Implementation,and Installation and Hosting etc. Serpent Consulting Services A provider of an array of services associated with Open ERP/Odoo such as Setting Up, Configuration, Customization, Integration, Migration and User training. Sodexis India Aprovider of Odoo/open-source ERP and CRM software services. Itcatersservices forotheropen-sourceapplicationssuchasJaspersoft, Magento, Compiere, ActFact and Google Web ToolKit.